Beautiful Lac Seul, in the middle of Canada's vast virgin wilderness, yields big catches of northern and walleyes. Lac Seul is noted for its big lunkers. Competent guides and first rate equipment are available from our camp to help make the dream of a record catch come true. Click here for a map of our region of Lac Seul (73kb). Click on any of the smaller photographs to link to larger ones. For sportsman's and family vacations alike come to Goose Bay Camp on Lac Seul, Ear Falls, Ontario. Try our Housekeeping accommodations or settle in at our boat-in outpost camp. We also provide a trailer park and tenting facilities. Package plan hunting is available. Our base camp on Lac Seul has ten modern cabins and a full service R.V. parking area including shower house. We rent boats and motors and have dockage for those that bring their own boat. The walleye fishing on Lac Seul is unequaled by any drive-to lake in both quality and quantity. Goose Bay Camp is located on the north end of Lac Seul four miles south of Ear Falls. Lac Seul is 110 miles long (over 180 km) and is Northwestern Ontario's premier drive-to walleye and northern pike fishery. We also have a three cabin boat-in outpost camp located on the south shore of Nungesser Lake, which is 35 miles (58km) northeast of Red Lake. This lake is 33 miles long (55km) and is an excellent walleye and northern pike fishery. Goose Bay Camp is situated in the heart of the finest moose, bear and bird hunting in Ontario; hunting that begins just outside the camp. Six different moose hunting packages are offered to suit your level of service and budget. Hunt bear on the second largest Bear Management Area in Northwestern Ontario, where our overall success averages 75%. Hunt ruffed grouse, ducks or wolves on a small game license. 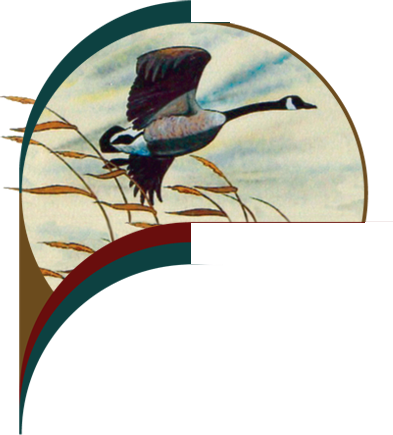 For an outfitter and guides that produce, come to Goose Bay Camps. We offer a fall bear hunts on 1,100 square kilometers of Bear Management Area: the second largest in Northwestern Ontario. We have a success rate of 80% for rifle hunters and 65% for bow hunters. Our adult moose allocation is in Wildlife Management Units #3, #4, and #5; whereas, we may hunt for calves and grouse anywhere. The ruffed grouse, bear, and moose populations are high and this area has well developed forest access roads to facilitate your access to all three species of game. For bear hunting see rates below and for moose hunting rates please get in touch with our camp. The boat-in outpost consists of 3 completely equipped cabins, a fish house, and an ice house with unlimited ice for your use. Motors and minnows packed in oxygen are picked up at the main camp; boats, gas, and ice are at the outpost. For tremendously good walleye and northern fishing try Nungesser Lake. Catch them off the dock or right in the bay where your cabin is located. You will find our cottages to be modern with full equipment for light housekeeping, including: dishes, linens, hydro electricity, electric ranges, refrigerators, running water, flush toilets, and private showers and bath tubs. All of the comforts of home. In July and August, there are abundant wild blueberries and raspberries. If you have only eaten cultivated blueberries wait until you get a taste of the wild berry. Lac Seul has numerous white sand beaches, deserted and pristine. There is also a public beach in Ear Falls and a number of other beaches in the area including public parks. Historical sites, a fine museum in Ear Falls, and striking photographic opportunities abound. For added variety, a part of your vacation may be spent at our main camp on Lac Seul, and part at Nungesser Lake outpost. Boats and/or motors for rent. Tackle and live bait available at camp. Confectionery at our camp store. Swings, playground and games at the camp. Shopping just 5 miles from camp. The following rates for 2018 are quoted in US funds. Provincial Sales Tax and Government Service Tax are at 13%. Please buy fishing and hunting licenses enroute. A deposit of $200.00 is required to confirm your cabin rental. No Pets Please. Small Cabins: includes cabin with two double beds (extra cot available at no charge), flush toilet, sink, electric lights, fridge, and stove. All towels, bedding, and dishes are provided, as well as, fish wrapping paper, freezer, and barbeques. Two people per week: $725.00 US. Each additional person $230.00 US per week. Medium Cabins: Includes mid-sized, modern cabin with flush toilet, private shower and bath, and with 3, 4, 5 or 6 beds. They're fully equipped with electric lights, fridge, stove and all towels, bedding, and dishes. Fish wrapping paper, freezer, and barbeques are also included. Two people $875.00 US per week. Each additional person $275.00 US per week. 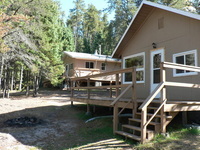 Large Cabins: Includes all of the above with 6 or 8 beds and 4 person minimum. Two people per week: $1050.00 US. Each additional person per week: $275.00 US. Children under 12 years old ½ price for additional cabin rate. We provide guides for $160.00 US per day for two people. Each additional person per day is $20.00 US. 16' aluminum, per day (Nungesser): $40.00 US. Naden Big Lakers, per day (Lac Seul): $40.00 US. 15 h.p. per day: $40.00 US. 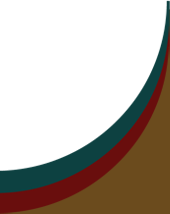 20 h.p. Yamaha, per day: $50.00 US. 30 h.p. Yamaha per day: $70.00 US. Dockage per day - private boats: $20.00 US. Beached private boats: $13.00 US. Electricity, water, sewer, and showers for a party of two is $32.00 US per day. Each additional person per day is $13.00 US. 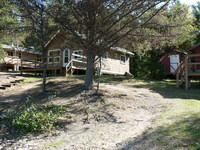 There remote cabins ammonocations up to 13 people on the south shoer of beautiful Nungesser Lake. Abundant walleue and large Northern Pike. Includes cabins, boat, motor, gas, minnows, towels, bedding, all dishes, propane stove, fridge, lights and barbeque. Also solar lights and central shower and wood heat. 16' Naden boats, 15 or 20 HP Yamaha motor, 6 gallons of gas, 5 dozen minnows per boat per day. Based on 2 people per boat. $600 US per person per week or $100 US per day. There is unlimited ice in the ice house at Nungesser. Minnows packed in oxygen are available for your outpost trip from Goose Bay Camps. Fishing: per person per day, 2 people per boat. Available on Lac Suel. No. 1: Includes modern cabin with 17' Lund, 40 hp 4 stroke electric start Yamaha with depth finder, gas and minnows. No. 2: Same amenities as above but three people per boat. No. 3: Including modern cabin, 16' boat, 20 or 30 HP Yamaha motor, 5 dozen minnows, 6 gallons of gas per boat per day. Our bear hunts are conducted from tree stands over active baits. $1600 US per hunter, includes cabins, active baits, bait, 17' Lund boat with 40HP motor, 7 day hunt. Deposit of $400 per hunter. Per person, based on 2 people on a 7 day hunt. 50% deposit is required by June 1st. No. 2: includes all of No. 1 except for the guide. No. 4: includes cabin & calf validation tag. No. 5, bow hunting: includes cabin, 16' boat, 30 h.p. motor, 50 gal. gas per week per boat, adult validation tag. Per person/based on 2 people 10 day hunt. To obtain a hunting licence for Moose, Bear, or Birds, it is necessary to produce a current or previous licence from your home state or province. Our area is also known for good hunting for Ruffed Grouse, Spruce Grouse, Sharp-tailed Grouse, and Ducks. Start planning for your most enjoyable vacation yet. © Virtual North and Goose Bay Camps, '96-2018. Spring and your next fishing adventure are just around the corner. See you on the lake soon!